The latest news in cosmetic surgery from around the world is the duty-free nose job that is now available in South Korea, Asia’s plastic surgery “capital”. Visitors from other countries who get rhinoplasty in South Korea will receive a refund on the value-added taxes (VAT) that are assessed to the foreigners who have the surgery. This is being done to help boost tourism in South Korea and to generate business for the more than 4,000 plastic surgery clinics there. While you could go to South Korea for a nose job, know that there are many other “destination” cities for plastic surgery and my hometown of Santa Barbara is one of the most popular. As a cosmetic surgeon in Santa Barbara, I have many patients that come from the Los Angeles and San Francisco areas to have cosmetic procedures done such as facial rejuvenation (facelifts, neck lifts, and much more) and body contouring liposuction. Destination cosmetic surgeries are popular for two reasons: it allows people to use their recuperation time as a mini-vacation and, for those wishing to keep their surgery private, the chances of running into friends or family is slim. Since this post is about rhinoplasty (also known as nose surgery, nasal surgery, or a “nose job”), I will tell you a bit more about what you can expect from the surgery – and how you can plan for it if you are making it a destination surgery. Most people have rhinoplasty to change the appearance of their nose. 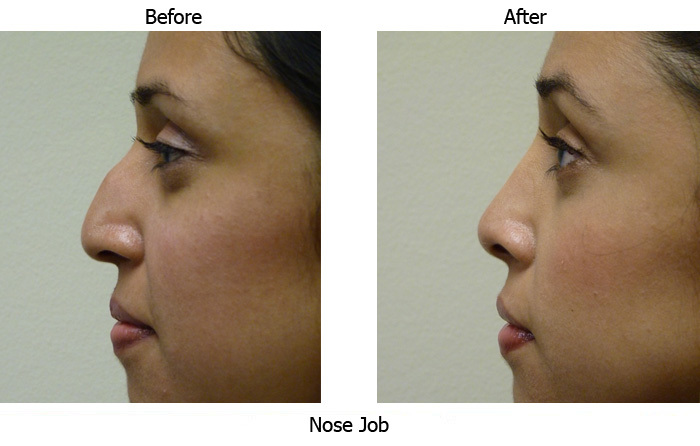 Nasal surgery can refine a bulbous tip, straighten a crooked nose, narrow a wide nose, and/or remove an unwanted bump. Noses can grow and change all the way through the teen years so the earliest time that I recommend to have surgery is the late teens and any time in adulthood. General anesthesia is not needed for rhinoplasty. A combination of local anesthesia, oral and intravenous sedation will keep the patient comfortable and unaware. This eliminates the “hangover” of general anesthesia and makes the person feel more like themselves during the first few days post-op. Most people take about 2 weeks off for the recovery and are able to return to work between 7 and 10 days. The majority of the swelling subsides within the first two months, but it usually takes about 1 year for results to be fully realized. If you would like to have rhinoplasty in Santa Barbara (or another facial rejuvenation cosmetic surgery procedure), it is important to factor in travel time including extra days for the consultation and post-op visits. There are many things to see and do in our seaside town, so you may also want to consider booking extra time to enjoy some of the festivals, museums, dining and wine tasting, and waterfront activities that Santa Barbara has to offer. More information is available on our Guide for Out-of-Town Patients. All of my clients who have made Santa Barbara their “destination” surgery city have been extremely pleased with the easy-going vibe of our town, the close proximity of our surgical center and medical office to the hotels, and the beautiful surroundings. They have returned home feeling truly rejuvenated both inside and out! If you are interested in cosmetic surgery in Santa Barbara, contact my Santa Barbara Cosmetic Surgery Center office – at 805.563.0000. Last year Rhinoplasty ranked #2 in the list of Top 5 Cosmetic Surgery Procedures of 2014 (breast augmentation was #1). Changing the breathing function (correcting a deviated septum) or trauma from an injury can be reasons for rhinoplasty but the majority of people who have a “nose job” – as it is commonly referred to – are doing it to change the aesthetic appearance of their nose. Bumps, humps, wide nostrils, a droopy or bulbous tip, or asymmetry are among the reasons that my patients have elected to have nasal surgery. When I perform rhinoplasty in Santa Barbara, I find that it is very important to consider the nose in relation to the rest of the facial features. My goal is to create a balanced profile that looks natural. An overcorrected nose can draw just as much (unwanted) attention as a nose that is too big for a person’s face. Nasal surgery can be performed on a younger person but I recommend that the person wait until their late teens as that is when the nose has likely finished its growing phase and the surgical result can be more predictable. The majority of nasal surgeries done at Cosmetic Surgery Center in Santa Barbara are with a closed technique that allow incisions to be hidden inside the nose. We use a combination of local anesthesia, oral and intravenous sedation to keep the patient comfortable and unaware. General anesthesia is not needed. Most patients experience minimal pain and some stuffiness (similar to a mild cold) for about a week after surgery and return to work 7 to 10 days after the surgery. A temporary option for smaller corrections to the nose can be done with injectable dermal fillers (such as Perlane or Restylane). Fillers can be used to smooth out irregularities and/or fix asymmetry issues on the bridge or the sides of the nose but not the tip. If there is an issue with the tip, it is much better addressed surgically. Using fillers can give a person an idea of how their nose would look if they wanted permanent correction through surgery. Dermal fillers can last 6 months or more and the results are instantaneous. Schedule a consultation for rhinoplasty in Santa Barbara by calling my office at (805) 563-0000. Are you happy with your “selfie”? Apparently these close-up photos (taken only as far as your own arm’s length) with a mobile phone are spurring an increase in facial plastic surgery. According to a very recent survey by the American Academy of Facial Plastic and Reconstructive Surgery (AAFPRS), “one in three facial plastic surgeons saw an increase in requests for procedures due to patients being more self aware of looks in social media”. As a result, the survey noted increases in rhinoplasty (10%), hair transplants (7%) and eyelid surgery (6%) in 2013 over 2012. Most people who take selfies do so in the interest of immediately sharing them with their friends on popular social media platforms like Instagram, Twitter, Snapchat and such. With so many of our interactions being “virtual”, a selfie may be seen by prospective romantic interests, friends and even employers before actually meeting the person in the flesh. That is probably why people want to get their selfie just “right”. Pictures taken at that close proximity can be like looking at yourself in a magnifying mirror where it is easy to pick at imperfections from acne to large pores to wrinkles to crooked noses and double chins. Some of these issues can be easily corrected – forehead wrinkles can be smoothed with Botox, while other wrinkles can be filled with dermal fillers; acne and large pores can be addressed with proper skin care in combination with professional aesthetic medical treatments (like chemical peels and laser facials). Structural facial concerns can be addressed with cosmetic plastic surgery such as Rhinoplasty (Nose Job surgery), Chin Surgery with an implant to make the chin/jawline more prominent, or Neck Lift surgery to fix sagging muscle, skin, and fat that may be contributing to a “double” chin. Eyelid surgery can remove sagging skin and bulges under the eye area that may make a person look tired or unhappy while a Facelift can redefine and reposition one’s face, giving them a rested and rejuvenated look. It is important to note that electing to have plastic surgery should not be made on a whim. Santa Barbara cosmetic surgeon Dr. Terry J. Perkins likes to educate his patients to help them understand their cosmetic surgery procedure, the recovery time involved, and the realistic outcome of their surgery. Once the decision has been made to enhance your look through plastic surgery or cosmetic aesthetic services, you will most likely be thrilled with the outcome. As Dr. Perkins has said, “When a person feels they look good, that comes across to everybody they interact with.” Whether it be in real life or in the virtual world, it will surely be a boost to your “selfie”-esteem. Book a Santa Barbara cosmetic surgery consultation with Dr. Perkins by calling 805-563-0000. When people think of facial cosmetic surgery, they are usually envisioning face lifts and nose jobs (rhinoplasty), not chin augmentation. Perhaps it is because most people believe that a face lift or nose job surgery has the most impact in improving an appearance. While we agree that having a face lift or rhinoplasty can enhance a face, chin augmentation should not be dismissed. People who are looking to balance their profile by refining their nose (whether it is reducing a bump, defining a bridge, or narrowing the tip) should also consider their chin and it’s overall affect on their profile. In fact, it is the neck, chin, and nose that work together to make an “aesthetically proportionate” face. So if a person has a nose job to reduce a bump and straighten a nose, but they still have a “weak” chin, then the likelihood of reaching the best aesthetic result is less than if they had augmented the chin as well. Likewise, if the chin is too big, a person’s profile can also be disproportionate. How can a chin be augmented? For a “weak” chin, a small implant can be added that fits the point of the jaw. Dr. Perkins will use a soft-solid alloplastic implant so that it can be customized to distinctly fit the person it is being used on. The soft silastic material of the implant is well-tolerated, will not leak, and, if desired, can be removed. For a prominent chin, bone or soft tissue can be removed to make it proportionate with the nose and the neck. If you decide to have both a chin augmentation and rhinoplasty, it can be done simultaneously. You may save money (one procedure instead of two) and will only have one recovery time. 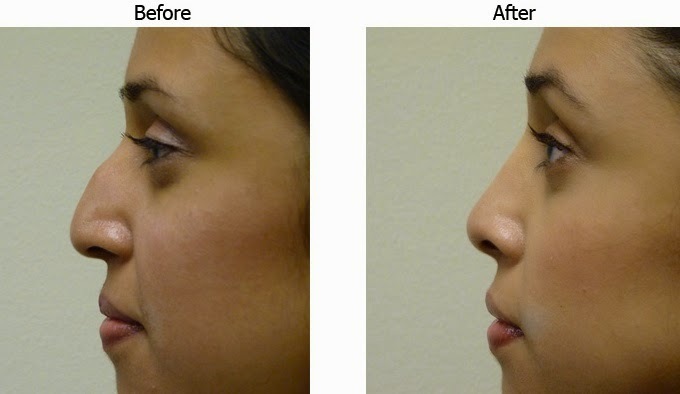 View before-and-after chin augmentation photos and before-and-after rhinoplasty photos on our Cosmetic Surgery Santa Barbara website. Schedule an appointment with Santa Barbara cosmetic surgeon Dr. Terry Perkins by calling 805-563-0000.